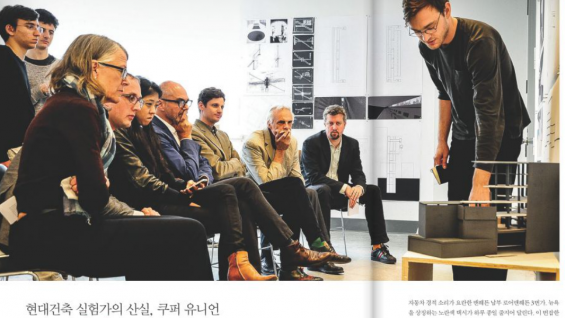 The School of Architecture has been featured in Korean Air's October 2014 issue of the magazine Morning Calm as part of its World Academies series. The article titled "Building Prestige" describes The Cooper Union as "one of the most unique and prestigious universities in the United States. Amongst the skyscrapers of Manhattan, the university's Irwin S. Chanin School of Architecture fosters creativity through a collaborative, community driven approach." Faculty member Guido Zuiliani, fourth-year student Jemuel Joseph and Acting Dean Elizabeth O'Donnell were interviewed for the article. Read the full article on page 72 of Morning Calm here.